HEY YOU. YES, ALL YOUR WEATHER GEEKS. Your weather forecasts are about to come with a bit less shouting. The National Weather Service is set to discontinue a longtime practice of outputting its weather advisories, summaries and other reports in ALL CAPS. 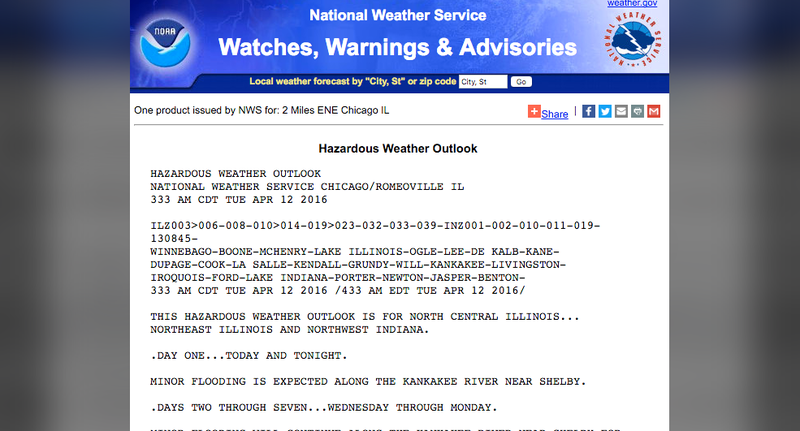 Starting May 11, the NWS reports will begin to use lowercase letters alongside their grown up siblings. The all caps practice dates back to when data was transmitted over old fashioned communication systems. Equipment wasn’t able to accurately read a mix of uppercase and lowercase letters, so the NWS used the modern day equivalent of “shouting via typing” to get around this limitation. The change will perhaps be most welcome in automated applications, such as websites and data feeds, that grab NWS advisories verbatim. These types of applications often end up displaying severe weather warnings in the rather difficult-to-read all capital letters. Though most systems that have issues reading lowercase letters are long gone, it will be interesting to see if any systems do run into glitches once this change is implemented. It’s worth noting that some applications where letters are meant to be in all caps, such as on-screen tickers, may need to be updated to retain the all caps formatting that’s desired.